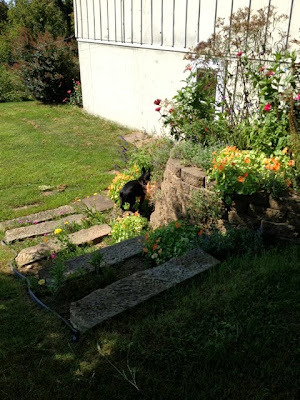 Julie Zickefoose on Blogspot: House Facelift! It was time. It was waaay past time. The gray-green color we'd chosen for our new tower 14 years ago had faded to a nondescript whitish. We could see the cedar siding right through it. On the old part of the house, the ca. 1978 board and batten siding was rotting away. We had to watch that for a long time, not having several spare tens of thousands of dollars lying around. Home ownership sneaks up on you, taps on your shoulder, whispers in your ear, and then finally flat out demands you DO SOMETHING. Bill refinanced our mortgage so as to generate some equity with which we could DO SOMETHING. For that I will be forever grateful. It takes guts to go into a bank with your tax returns, pull down your financial pants. We got some estimates. One estimate to paint just the tall part of the tower was $13,000. The contracter talked about bringing in a cherry picker. I guess you have to rent those. Ack. File under: things you don't think about when you're building a birdwatching tower. We found Before and After Remodeling. Donny and Jessica were the perfect fit for this project. No cherry picker. Scaffolding, and fearless men to climb it. They came, they saw, they estimated, they returned a quote within days. 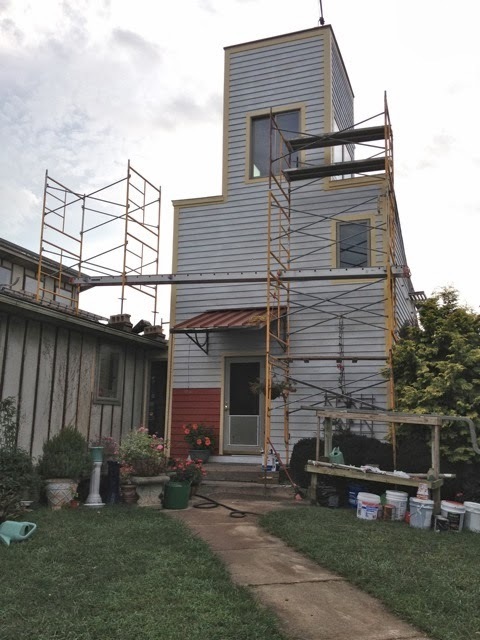 We would re-side the old (low) part of the house with Hardie board, which is a permanent siding made of wood, cement, and fairy dust. 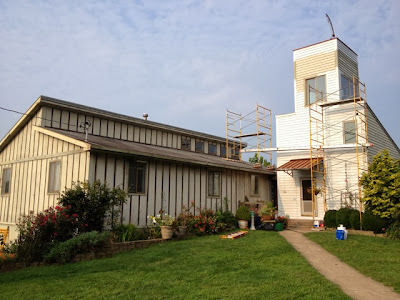 We would paint the cedar siding on the new (high) part of the house. 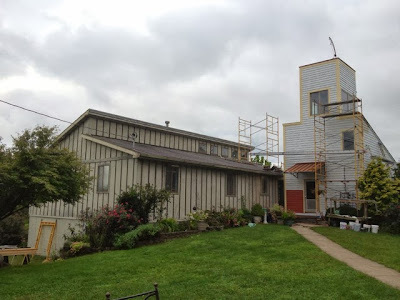 And the siding would all be horizontal, and at long last it would match. The boards came off the batten, leaving the old part of our house looking like a root beer stand. Scaffolding went up. Primer started to go on. Sept. 13, 2013. The first patch of color went on. You are doubtless not surprised at our choice, given my fixation on old barns. I love barns so much, I want to live in one. Minus the hay and manure. But you can be sure that if they made a scented candle that smelled like fresh hay and manure, I would be the first to buy it. Cow or horse. Not pig or chicken. I have limits. Although pig has a certain nostalgic appeal for me, it is much too clingy for most people. We would bring new Hardie board siding down over the awful cinder-block foundation on the old part, all the way to the ground. It was exciting to see a patch of the color our house would become. September 13, 2013. Before and After Remodeling doesn't fool around. All of this magic went on while the kids and Bill were away at school and work. I got to witness it. 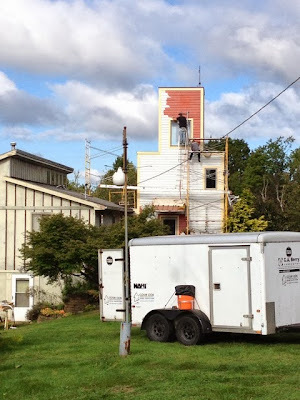 I chose to look at living amidst the noise of nail guns and the clutter of vehicles and lumber and scaffolding as part of the transformation, part of the fun. And it was fun to watch our house become a barn! I'll have to show Sim this. He's had his mind on painting our little yellow into a Falu red for years now. I think our project's not far behind once he sees your genius. Go, zickthompsonrenovators, go! -Katie F.
Oh m' goodness. Now we BOTH get to live in a barn! Exceptin' that mine is green, and still board and batten. None the less, happy barn living, dear friend and country neighbor. Now we definitely need to make an autumnal visit to your hill. Red ! A classic and iconic choice for a barn ! I want to live in a renovated barn too ! We've been sporadically remodeling our early 70's tract as well and while the remodeled parts are spectacular,the upgrades have made the parts we can not afford to tackle resemble a crack house. My master bath looks like an underground bunker in the Golan Heights. 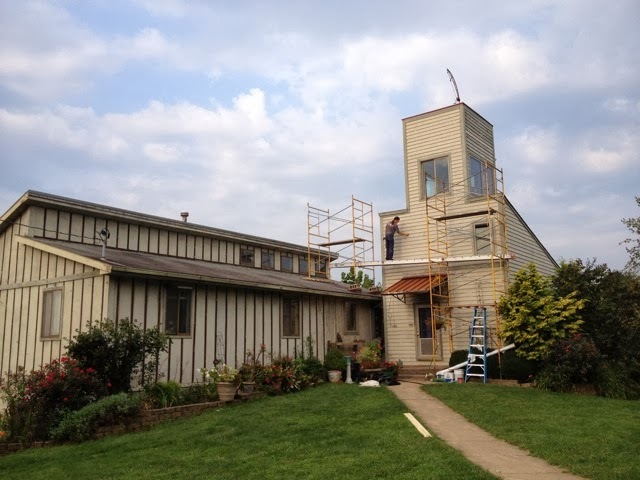 I cannot wait to see your 'little red barn ' finished ! I love the color Julie! I live in a 1980's contemporary in CT. I keep going back and forth between a grey green or barn red. My friend, who is a real estate agent , almost had a heart attack when i mentioned the red. I also want to put a standing seam metal roof on it and add some stacked stone to the entry way. We too are looking at the "tap on the shoulder" as we have roof and rotten wood issues. I cant wait to see the pictures as your project moves ahed. BTW, please give Chet a hug for me! Really looking forward to the rest of the story! Your house is going to look great, I can tell, from the teaser you are sharing with us. "Candles that smell like hay and manure" and "pull down your financial pants", oh my you make us chuckle. We are awaiting the sequel and yes, you could pull off writing a best seller Julie. Love the name--Before and After Remodeling. We too found a great contractor who does our projects (as we have the funds to do...) And he is reasonable, endlessly honest, unfailingly polite, and perfectionist to the core. The only downside--he likes to listen to Rush Limbaugh. Shudder. But he does such good work that I forgive and overlook. Anyway--CAN'T wait for the "to be continued." As a retired banker I will say I never heard the phrase "pull down your financial pants" before, however, I guess that from the other side of the desk you could look at it that way. My experience with home renovations is it takes twice as long and costs twice as much. If if it is major construction/renovation you will find that the world is on back order. We painted our house a beautiful dark barn red with cream/white trim. It's a beautiful color. Love that you painted your house that color too. My grandparent's house in Maine - the house my mom grew up in - was a beautiful barn red over cedar shakes. With white trim. It was beautiful. I have a particular fondness for red houses. Can't wait to see the After pictures. "It takes guts to go into a bank with your tax returns, pull down your financial pants." How True!!!! And, I love Barn Red. Happy for you! I think you will really like the Hardie boards. My mother has them and they look great 15 years later. We have a basil living room, yellow hallways, a green kitchen, a blue dining room, a yellow bedroom, a chile pepper red bedroom, a lavender bedroom, a vanilla bathroom, a blue bathroom, and a white bathroom. Wait... how did that white bathroom slip past me? Be bold with color barnophile. Can't wait to see the final results. It's going to be fabulous! Our house in Mexico is red, not far from the color you're going with for your house. Cobalt blue roof would definitely send you into the Mexican vibe. Northerners here tend to be color shy. Glad you're putting your bold foot forward. It will be splendid. We have Hardie plank on our house here in KY. Love it. Your post is like the last few days before Christmas. Waiting, with anticipation, to open up that special gift! And in this case, the "after" photos and post. Take care & hang in there! Love to Bacon. I can so identify with this. I built out house with T1-11 siding that looked (or was supposed to look) like vertical plank siding. Ten years later it was starting to deteriorate, so we went with Hardie plank siding. I briefly considered doing it myself, but decided I didn't have enough lifetimes left, so we hired it out. Ours is gray. And then I decided the concrete-block foundation needed cultured stone, which I'm doing myself. It's taking a while. Yours is looking very nice, indeed. You will be very pleased with the result and it won't take long before you can't even remember what it used to look like.